Recently I got the urge to move all film development to a Jobo CPE-2 I had accumulated, not for any particular reason other than that I've gotten too lazy to stand around doing manual inversion agitation and that I could develop 35mm, 120 and 4x5 film all together in the same run if I wanted to. I knew that simply assuming a specific development-time compensation wouldn't be valid. Jobo recommends a five-minute presoak and the intermittent-agitation development time as a starting point based on their finding that it gives the closest starting point to what would turn out to be the correct time. Phil Davis has shown that various films behave differently when given a long presoak; some gain or lose contrast, some gain or lose speed or any combination of those things. He also wrote that a short presoak doesn't cause any significant changes. I decided to use a one-minute presoak to avoid airbells and to arrive at new development times via testing. The goal was to match CIs and curve shapes to those I'd obtained when using intermittent agitation. The first film I tested was Ilford HP5+ in D-76H (my standard developer) at dilutions of both 1:1 and 1:3. 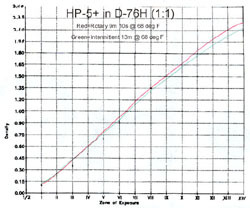 The result was that HP5+ required a 25-percent reduction in development time for continuous rotary agitation, and that was valid for both dilutions. Both rotary and intermittent agitation gave EI 400. I also found that contrary to conventional wisdom there were no significant differences in curve shape resulting from using continuous rotary agitation vs. intermittent agitation. The next film I tested was Ilford Delta 100. In this case, a 35-percent reduction in development time was needed in order to match CIs and significantly lower EIs occured. 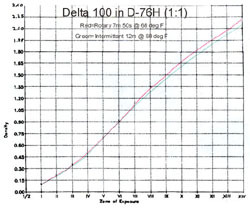 Delta 100 in D-76H 1:1 and 1:3 gives EI 160 with intermittent agitation (although I shoot it at EI 100) but with rotary agitation it gave only EI 100 in D-76H 1:1 and EI 80 in D-76H 1:3. Also, the curve for the 1:3 dilution showed a mild shoulder. The last film I tested was Ilford Delta 3200 in Ilford DD-X, which I usually shoot at EI 1600. It needed only a 15-percent development-time reduction, which was surprising. My testing didn't address edge/adjacency effects. Prints made from films developed with both methods appear equally sharp, and no significant differences are seen when looking at the negs with a 30x magnifier. The only published experimental results I know of appear in Controls in Black and White Photography by Dr. Richard J. Henry, in which he states that adjacency effects are caused by lateral diffusion in the emulsion layer and aren't affected by agitation. 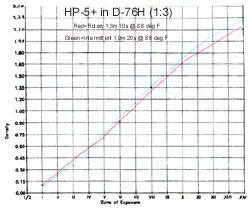 To sum up, looking at three films, two "core-shell technology" types and one conventional type, I found that the reduction in development time needed for continuous rotary agitation rather than intermittent agitation ranged from 15 percent to 35 percent, that for two of the films the EI remained the same while the EI for one film decreased, and that the curves are pretty much all the same within the 14-stop range tested.